So this is what happens when you allow a pro-abortion, enviromentalist machine like FAIR and NumbersUSA to write your policy proposals, you get recalled and as early reports indicate, voted out. Like George Will, many of us were in wait and see mode when it came to SB 1070. However the truth came out quickly as to the intentions of the proponents of SB 1070. The revelation came that the entire SB 1070 movement was using its newly found political power to turn into a Birthright Citizenship lobbying movement. Russell Pearce supporters did not respond to the murder of a rancher by supporting SB 1070 in order to mandate the deportation of "anchor babies." SB 1070 found support because its crafters appeared to be laying down the groundwork to a serious solution. Unlike Utah, who would implement a guest worker program and mandate the identification of all illegals with a separate card, Pearce doubled down on FAIR and NumbersUSA's agenda. This drove Pearce supporters to turn on him and move to oust him. Instead of locking down the border, and using the undivided attention of Arizonians to help push policy solutions that balanced the rule of law with free market solutions, Pearce doubled down on the mass deportation by attrition agenda. His supporters realized that proponents of SB 1070, such as Pearce, weren't honestly trying to repair the fed's mess, instead they saw a group of loud opportunists hiding under the label of "conservatives" carrying out someone else's hidden agenda, not solving the real problem, and hurting our Republican party in the process. Now think of our party's guilt by association problem, our messaging problem, and having to find a way to repair our image with the type of voters that first supported Pearce, but now have decided to throw him out. 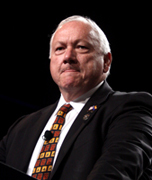 Russell Pearce is the only State Senate President in American history to be recalled by his own constituents.